All the M-Ladies (Mary, Marie and Mathilde, sounds like the beginning of a fairytail about three princesses) look lovely! Beautiful! Uninspiring dresses and these pillbox hats look ridiculous, but the flower thing on Maries head is not better. Sorry, but I can't see anything fashionable in these photos. 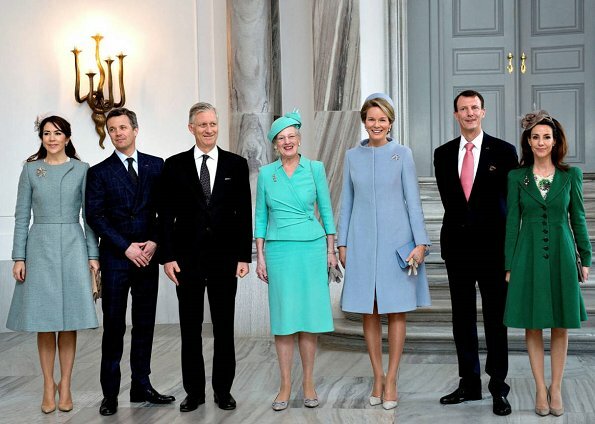 The turqoise of Queen Margarethes suit hurts my eyes. And together with this fur coat?? Quite honestly, no!! Mary and Marie are both women in their forties. What do they want to be with this long hangig down hair, without a real hairstyling? Snowhite? Seems rather like a princess dream of a eleven year old. I love seeing the joy that Mathilde and Mary show in seeing one another. When I saw these photos, my first thought was that I was looking at old pictures from 1950. 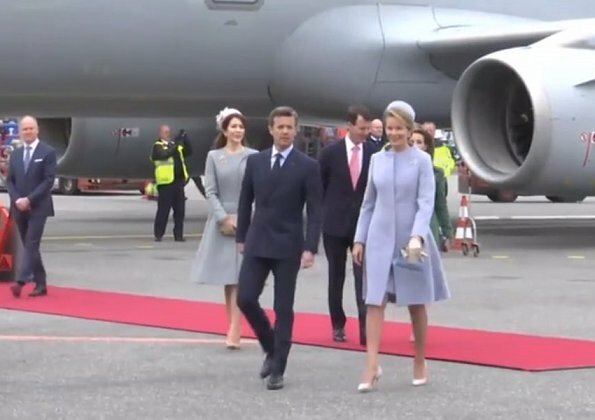 They all look so old fashioned with their coat dresses and pillbox hats. There's even a few photos I've seen elsewhere of the ladies getting into a vintage car. It's not a good look in my opinion. I hate this style of "princess dress up" where young women have looked like they've just stepped out of a time machine. 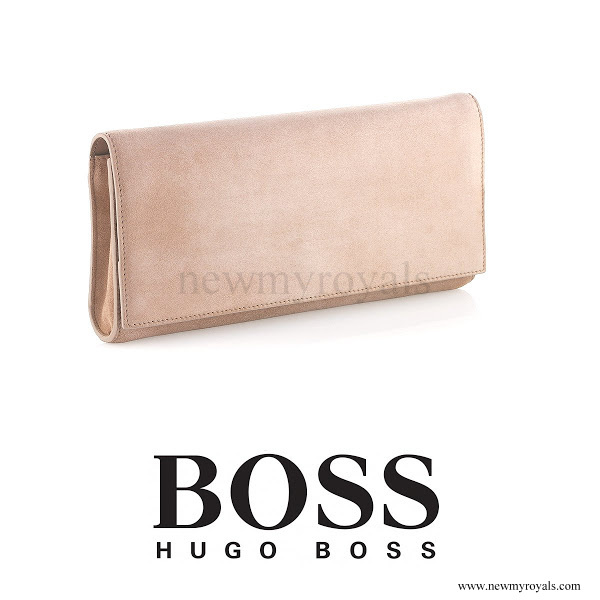 There are plenty of ways that you can look elegant and fashionable without having to look like you're in the wrong decade. Very bland, and retro, but not in a good way, although Mathilde's outfit could have worked in a better colour. Also, I'm getting tired of Mary's teenage hair and smug expression. And Marie looks rather odd with the fussy coat and silly headpiece. Seriously what's going on with Mary and that smug/smirk look on her face. I see it too Heather. Possibly her new fillers/botox that's making her face appear like that unintentionally. Or she just likes to look smug lately. She has that swollen (bloated?) face of those who have recently undergone fillers/botox .... same as Charlene .... which is sad because they don't need these procedures so often. 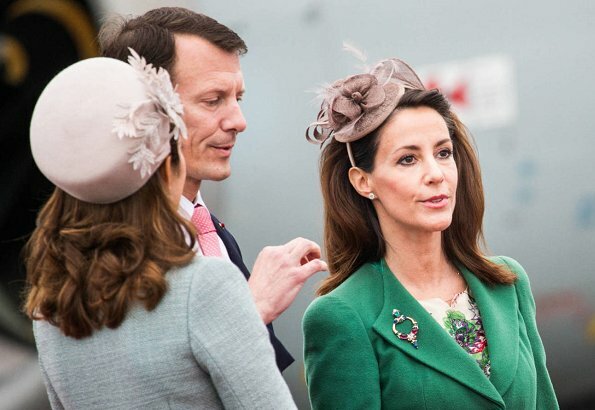 Quite like Marie's coat, not so much the fascinator ! Mary's outfit for me looks bland and lacking in colour. Mathilde suits the pastel colours. 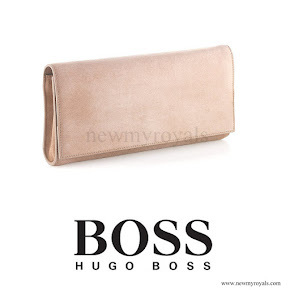 Let's hope the ladies pull out all the stops for tonights state dinner. 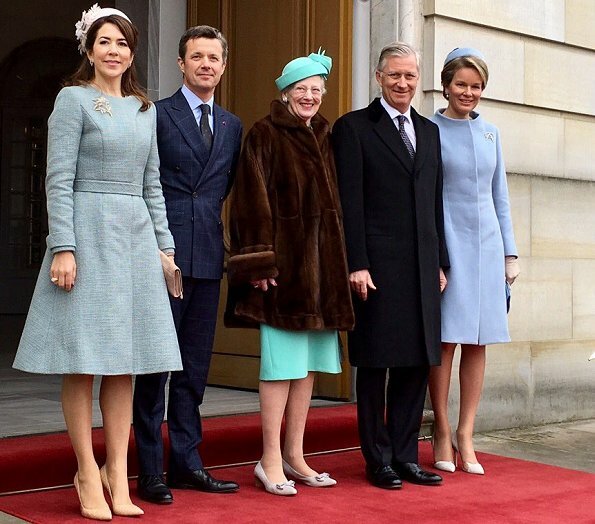 They look mostly good, only thing I do not like at all is Marie´s fascinator. i have always loved Marys dress...but of late i just dont like it. her outfit doesnt do it for me. Maries outfit is a NO! 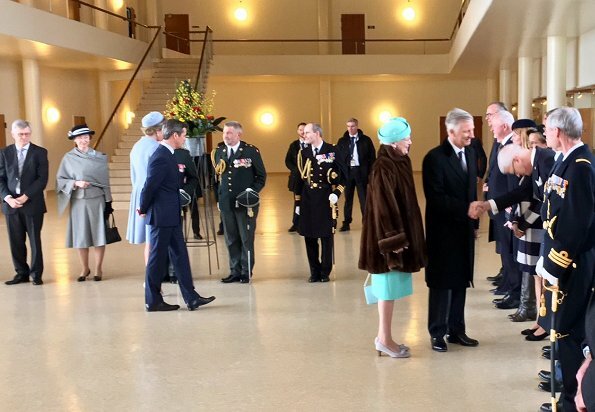 Queen Margrethe's bright turqoise dress and hat, and the fur coat, is a huge mishmash. Like Beth said, it makes my eyes hurt! Mary looks great as always. But Marie's outfit is horrible, and what's that on her head? That's just awful. I think Mathilde would win best dressed if there was a competition on this day for best retro look, with Mary coming a close 2nd. 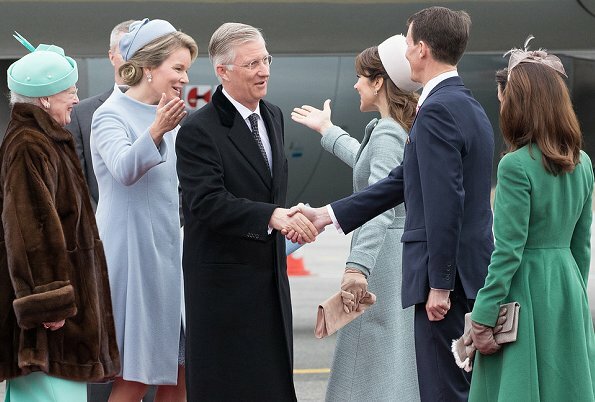 Queen Margrethe's and Marie's ensembles made me cringe, both are dreadful, but not surprisingly so. They all look lovely!! Mary's coat is awesome and I love her choice of accessories!! I can see why she's on a best dressed list. 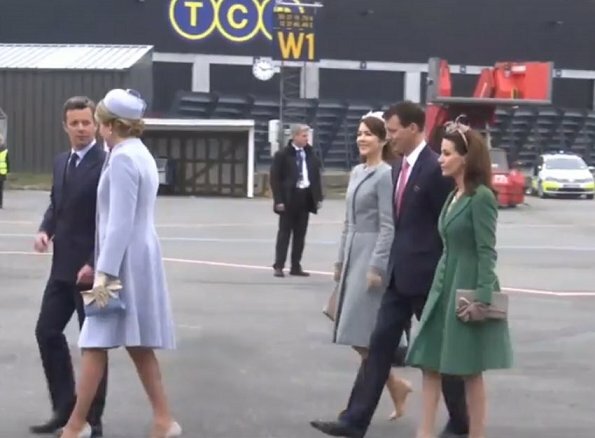 Queen Mathilde's outfit is beautiful too!! 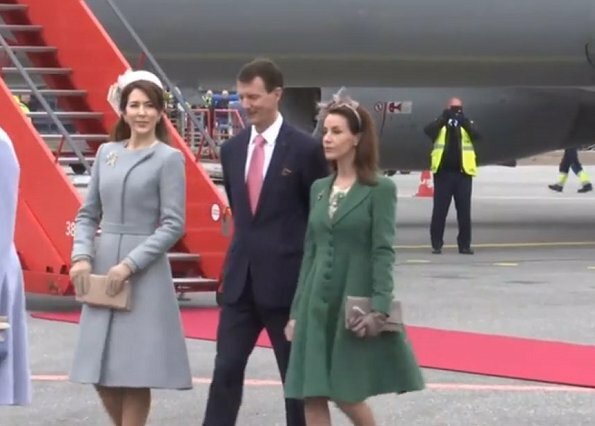 Hier trägt die Kronprinzessin einen sehr erwachsenen Mantel. Einzig die Verschlusslösung am Kragen durchbricht etwas die Strenge. Er sitzt der KP wie angegossen: perfekte Länge an genau der richtigen Stelle des Beines. Wie es scheint, haben sich die Damen für das Blau/Grüne Farbenspektrum entschieden. 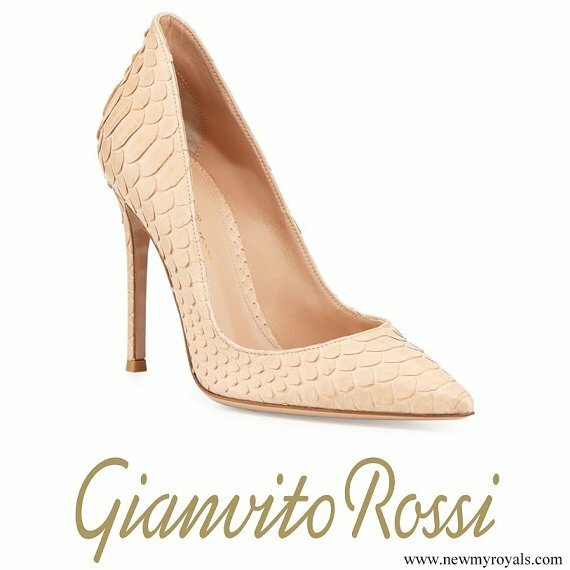 Zu Marys Wahl passen die nudefarbenen Laboutins natürlich sehr. Die Pillbox hätte ein wenig weiter nach hinten gerückt sitzen können, aber das ist Meckern auf hohem Niveau.